JACKIE LOMAX is considered to be one of the best white Soul/Rhythm & Blues voices/songwriters to have emerged from the 60′s and 70′s. Added to that he was the very first artist signed to The BEATLES then new label APPLE RECORDS and his debut single was ‘Sour Milk Sea’ written by one GEORGE HARRISON. Following on from the much publicised demise of Apple Records he joined bands HEAVY JELLY, BADGER and BALLS as well as releasing in the 70′s two much acclaimed solo albums. 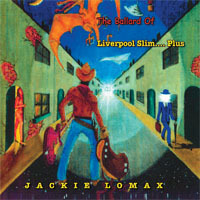 In 2001 he released his first solo album for over 20 years ‘The Ballard Of Liverpool Slim’ virtually picking up where he had left off-writing and playing R&B, Blues and Soul. Pure Soul/Rhythm & Blues at its finest and not depressing at all. Beautifully sang, groovy guitar work, aptly placed brass work, keyboards and a 'get on your groove' style funk; making me click my fingers and softly nod my head to the inspiring sound. ...his first solo release in 20 years, restated his love for soul and blues.